National Recreation Systems (NRS) is a leader in aluminum bleacher manufacturing, custom design services and project management. 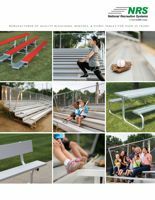 NRS provides high-quality seating systems that include small portable bleachers, large seating systems, team benches and custom design. NRS also offers renovation options to update non-compliant bleachers to current building and safety codes. With a central location in Indiana, NRS can provide excellent service and affordable delivery anywhere in the United States in a timely manner. NRS is a PlayCore Company. PlayCore helps build stronger communities around the world by advancing play through research, education, and partnerships. Our company infuses this learning into its complete family of brands. We combine best-in-class planning and education programs with the most comprehensive array of recreation products available to create play solutions that match the unique needs of each community we serve. View the NRS product selection in our catalog or call us direct for a customized project consultation: 888-568-9064.